CORVALLIS, Ore. (AP) — Joe Williams came out of retirement and ran for a 5-yard first-quarter touchdown and No. 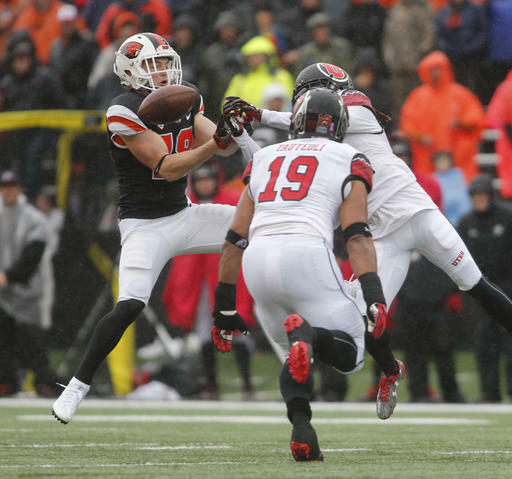 21 Utah went on to defeat Oregon State 19-14 in wet and windy conditions on Saturday. Williams, who had left the team because of injuries following the second game of the season, finished with 179 yards rushing on 34 carries for the Utes (6-1, 3-1 Pac-12). Trailing 12-7, Oregon State (2-4, 1-2) got as close as the Utah 9 with 8:25 left in the game, but couldn’t score and Garrett Owens’ 27-yard field goal attempt went wide left. After quarterback Troy Williams ran for an 8-yard touchdown to extend Utah’s lead, the Beavers scored on Marcus McMaryion’s 14-yard pass to Hunter Jarmon. But ultimately Oregon State couldn’t overcome its first-half struggles. 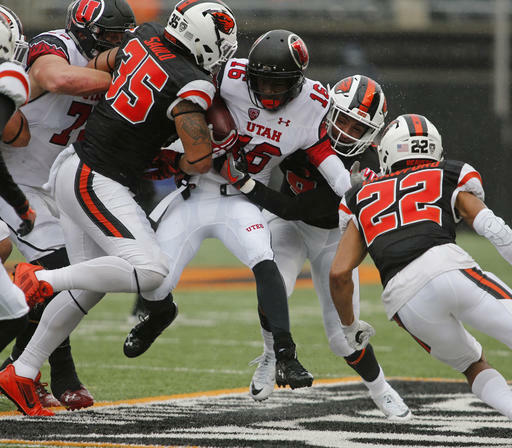 Joe Williams’ return to practice this week was spurred by a spate of injuries to Utah’s running backs corps — a concern because the wild weather expected for the game would undoubtedly impact the passing game. Oregon State started running back Ryan Nall, who was seen in a boot earlier this week. But after a carry for 32 yards in the opening quarter, he did not return. Nall rushed for 221 yards and three touchdowns last week in Oregon State’s 47-44 overtime victory over Cal. Following Williams’ early touchdown, the Utes also scored on a safety after a bad punt snap and Andy Phillips kicked a 25-yard goal to take a 12-0 lead into halftime. Oregon State closed the gap with an 18-yard touchdown run from Artavis Pierce, but Owens missed a 51-yard field goal attempt midway through the third quarter that would have gotten the Beavers closer. Utah: Safety Chase Hansen had an interception a sack and two tackles for loss — all in the first quarter. … Troy Williams was impacted by the weather, completing just four of 13 passes for 42 yards. Oregon State: After a sloppy first half that included just 55 offensive yards, the Beavers exploded for 107 yards in the third quarter as they narrowed the game. Oregon State quarterback Darell Garretson completed 4 of 20 passes for 24 yards before he was injured in the fourth quarter. Utah became bowl eligible with the victory, and should hold steady in Sunday’s AP Top 25. The Utes were tied at the top of the Pac-12 South with Arizona State and Colorado going into the game, with the Sun Devils facing the Buffaloes on Saturday night in Colorado. The rough weather was caused by the remnants of a Pacific typhoon and led to widespread power outages in Western Oregon. The crowd for the game was meager, with many wearing orange rain ponchos, but they cheered when the sun briefly came out in the second quarter and “Walking on Sunshine” blared from the Reser Stadium PA system. Utah: The Utes play a second straight on the road at UCLA, which played at Washington State on Saturday night. Oregon State: The Beavers visit No. 5 Washington, which had a bye this week. The Huskies are coming off a 70-21 rout of Oregon last weekend.